James headlined the opening night of 2018's Party At The Palace in Linlithgow with a set that pulled heavily from their number six (two in Scotland) album Living In Extraordinary Times and its predecessor Girl At The End Of The World as well as nodding to their thirty-six year strong back catalogue. This gig was close to being pulled late afternoon as the effects of a cold and an almost twenty-four hour delayed trip from their previous gig in the Azores meant Tim Booth's voice was struggling to function in the way needed to complete a close to two hours set. 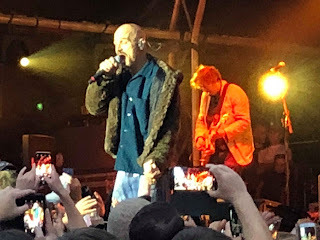 Some careful adjustments to the setlist, such as stripping back the exultant Coming Home (Part 2) to a more restrained yet no less impactful acoustic version and the inclusion of songs like Seven, Dear John and Say Something meant that the day was saved. James do have a conundrum here when they play these type of festival sets. Most bands of their age focus their sets on their biggest hits, like Cast did earlier in the day, or have written new material that diverts so little from their course that a casual fan probably couldn't tell the difference anyway. That's something James have always shied away from - even when they were belting out hit after hit in the mid 1990s, the songs that sat behind them on the albums showed a band intent of pushing their own musical envelope (look at the difference in styles between Seven and Laid, Laid and Whiplash, Whiplash and Millionaires as evidence). 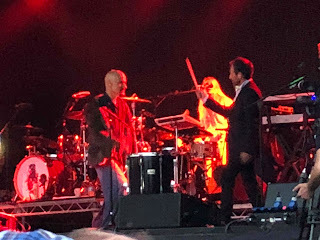 Their latest offering, Living In Extraordinary Times, continues that trend, exploring the use of percussion and with the addition of Debbie Knox-Hewson to the live set-up, that's even more evident on stage and, in James tradition, permeates into their treatment of songs from their back catalogue. They start with Out To Get You though, familiar from its position as the only non-single on their 1998 Best Of and Tim doesn't need to sing for the refrain of the song as the crowd take it over and holler back, in various states of drunkenness and tunefulness, words of desperation and self-doubt amplified nine thousand times. Then they dive head first into the new material with Better Than That, where Tim makes his first venture out into the crowd, declaring he wants to go where security won't let him, and a powerful punching Hank which starts with a maelstrom of drums that has the audience clapping along to the beat that ushers in the vitriolic yet targeted attack on the self-anointed leader of the free world and finishes with Tim bending the knee as the NFL players have done in protest at Trump and the rise of the American right. 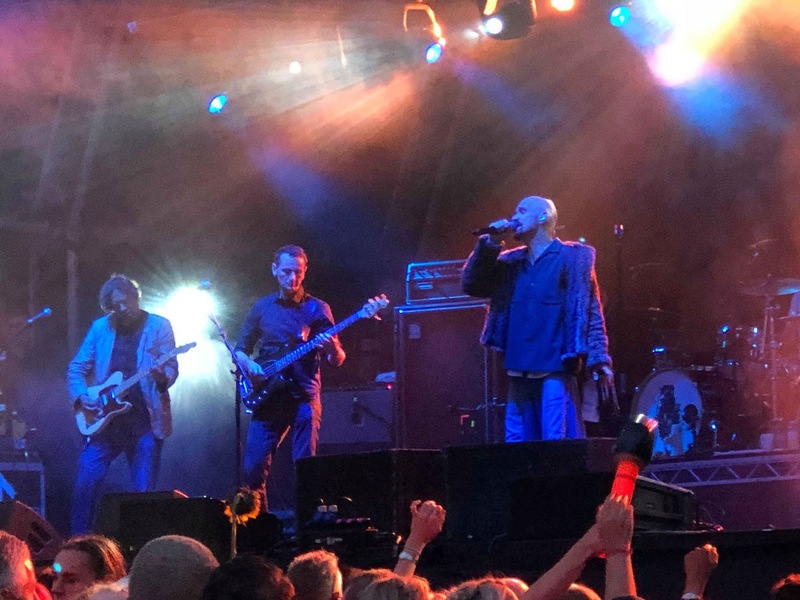 Seven makes a welcome return to the setlist as one of the often overlooked singles of James' commercial peak in the UK. It's dropped down a key, but doesn't lose any of the soaring majesty of the chorus, whilst Say Something, the closest we get tonight by the James by numbers demanded by the Sit Down / Best Of brigade on social media, sees Tim out in the audience, literally, as his attempts at crowdsurfing see him dropped and performing most of the song trying not to be mobbed. He jokes about health and safety but stops them continuing until he makes sure everyone is OK. The middle section of the set is very much the James of today. Dear John swirls beautifully around the arena, whilst Leviathan, for many the stand out track on the new album, is gloriously uplifting, building to an orgasmic explosion as the chorus arrives climatically. The gig stops for a minute as a couple are invited on stage and a wedding proposal is made and accepted. Fittingly, Nothing But Love is played next, a song that did so much for the last album, and the sort that in a different era, would have been a huge hit. Tim explains that they've got to strip down Coming Home (Part 2) because of his voice problems, but it's even more affecting and heartfelt in this more modest form. "This is one of the first songs we ever wrote" is the introduction for Stutter, a song that's evolved from a spindly delicate song into a huge sprawling beast, that feels somehow apt amongst all these percussion-heavy new songs. As strobes flash and Tim loses himself in the music, it feels like there's a million drums banging out the primal beat. Heads next to it joins up the lines of this side of the James family tree, a huge energy coursing through the roots and veins of the song. Saul tells us that Living In Extraordinary Times reached number 2 in the Scottish charts "the only charts that matter" and that they're proud of the album, but as the opening strains of Born Of Frustration ring out, the crowd burst into life again, a mosh pit circle forms to one side of the stage and people let loose. Laid is given an ecstatic reaction, starting slow with the crowd singing back every word, some of them in the wrong order, before the band take over, building it through the first two verses, before letting go and starting again. Joking that they're making up the set as they go along, Many Faces is next, a song that almost breaks down half way through as they seem to be having problems on-stage, but which they regroup and rescue and finish with the crowd singing back the "there's only one human race, many faces, everybody belongs here" in a way you'd never expect a crowd to do for a song that many of them wouldn't know. That singalong is repeated, more expectedly, for Sometimes, before which Saul starts to aim a tirade at those championing Brexit. You sense now that any ordinary band would finish by rolling out the biggest guns, but the contrary James deliver Attention, a huge sprawling journey song that was at the centre point of their last album Girl At The End Of The World, building slowly, dropping down and then building back, led by a powerful kick drum. Dispensing with the encore ritual due to the impending curfew, they strip everything down for an eerie mystical Top Of The World, a typically awkward move that goes against the obvious. They do finish with a bang though, if not the one that so many wanted, as the siren call of Come Home takes people back to the days of Madchester, albeit a looser, less rigid and more ragged round the edges, like many of those hollering back every word. James and festivals are a curious mix. Tonight's set had something for everyone - a lot of the new material that the band has, rightly, such obvious faith in, many of their best known songs and the occasional curveball. Tim's voice holds up well, helped by the set list selection which in its own way brings variety in. Some will have been disappointed by the omission of the likes of Sit Down, She's A Star, Tomorrow, Sound and Ring The Bells, but such emotions betray a lack of understanding of what makes James tick. A band that turns up and just churns out the hits are nothing more than a performing monkey, stealing a fee rather than living in the moment. If James ever did that, they'd be dead. James played Out To Get You, Better Than That, Hank, Seven, Say Something, Dear John, Leviathan, Nothing But Love, Coming Home (Part 2), Stutter, Heads, Born Of Frustration, Laid, Many Faces, Sometimes, Attention, Top Of The World and Come Home. James play festival shows at Scarborough Open Air Theatre (18) and Drumlanrig Electric Fields (30) before heading around the world in November to Auckland Powerstation (November 11), Christchurch The Bedford Marquee (12), Melbourne The Forum (14), Sydney Metro Theatre (16), Brisbane Tivoli (17), Adelaide The Gov (19), Perth Astor Theatre (20), Dubai Irish Village (22), Cape Town Kirstenbosch National Botanical Garden (24) and Pretoria National Botanical Garden (25) before returning to the UK in December for shows at Glasgow Hydro (5), London Wembley Arena (7), Manchester Arena (8) and Leeds First Direct Arena (9). TimBoothLyricADay, whose posts often lead to Tim explaining his thought processes behind the lyrics, can be found on Twitter and Facebook.